What does it take to hike all the trails in the Great Smoky Mountains National Park and join the 900-Miler Club? JP Smith, Dave Worth and Steve Pierce know the answer. 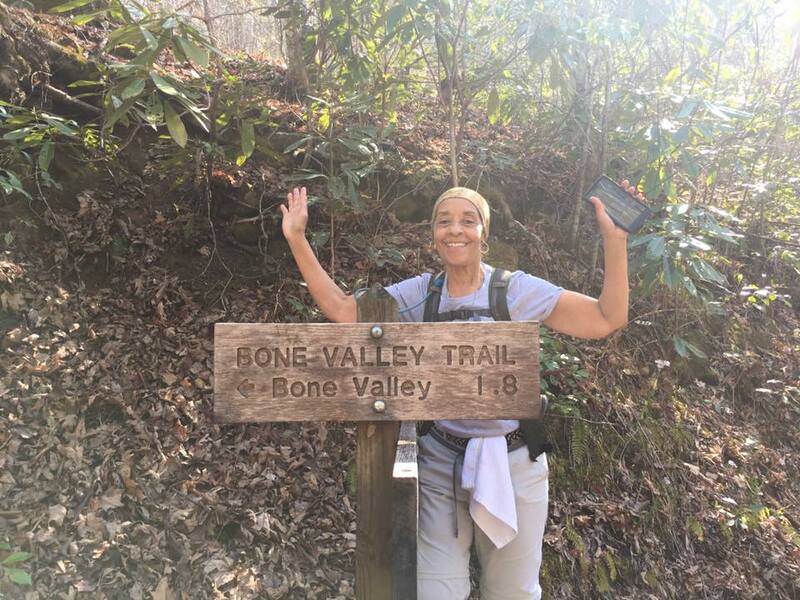 They have hiked all the trails and joined the Great Smoky Mountains 900-Miler Club for those who have accomplished that special hiking challenge. The three hikers shared their advice and experiences at a panel discussion hosted by Friends of the Smokies at Nantahala Brewing in Asheville. The panel was moderated by Danny Bernstein, a 900-Miler Club member who has hiked the Appalachian Trail (AT), the Mountains to Sea Trail across North Carolina, and three Caminos de Santiago. JP Smith is a retired law enforcement officer from Maggie Valley, North Carolina. She holds a B.A. in Criminal Justice and M.A. in Education, and was an Army Medic for six years. 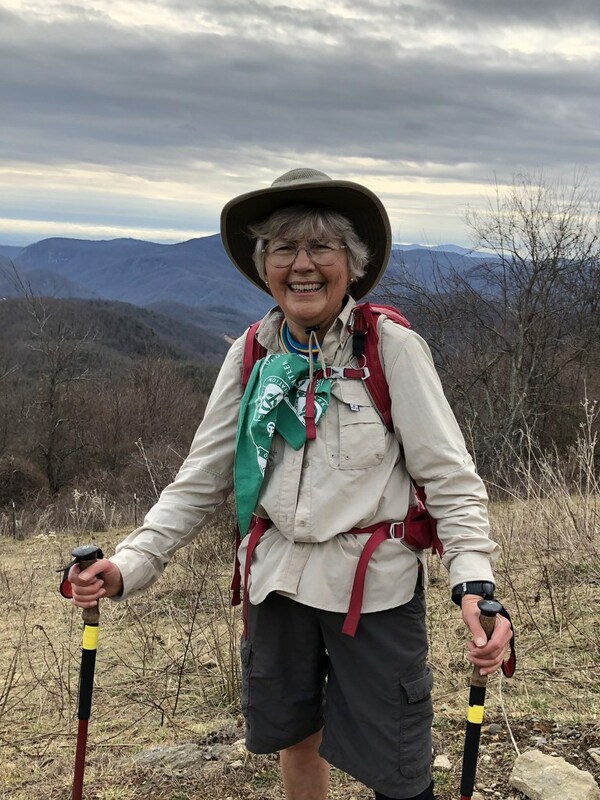 Besides completing the Smokies 900, she walked the Camino de Santiago and cycled from Boone to Wilmington. Dave Worth is a former National Park Service Ranger in the Smokies. 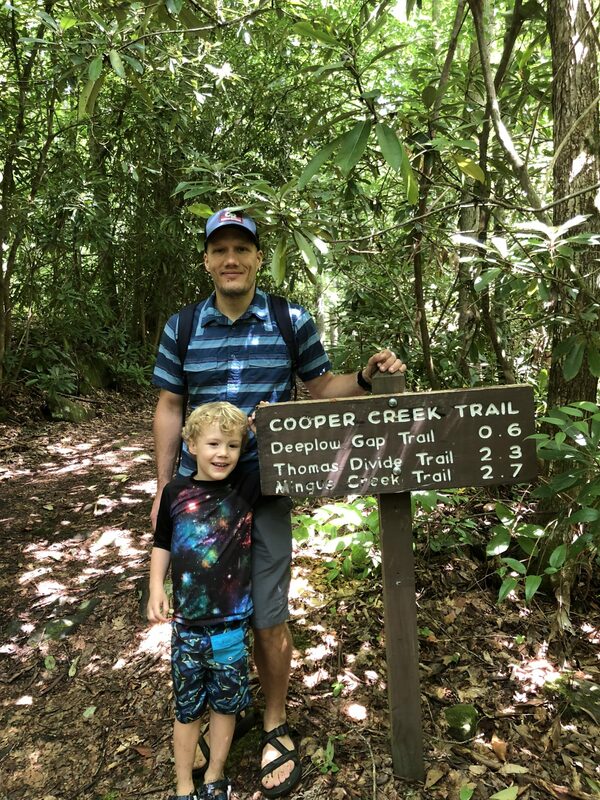 Dave completed all the trails in Great Smoky Mountains National Park in 2018. He thru-hiked the AT in 2008 and currently holds the fastest known time for running the stretch of the AT passing through the Smokies. He also holds the record for running all the trails leading to the summit of Mt. Le Conte. Steve Pierce is a retired teacher from Marion, North Carolina. He is an avid hiker and leads hikes for FOTS and the Carolina Mountain Club. He is nearing completion of a second map. Steve has completed the South Beyond 6000 challenge — summiting 40 peaks of 6,000 feet — reached the summit of Mt. Kilimanjaro, hiked the Salkantay route to Machu Picchu, and walked the Camino Portuguese. I asked the three hikers to share their insights about hiking all the trails in the park. FOTS: Why did you decide to hike all the GSMNP trails? 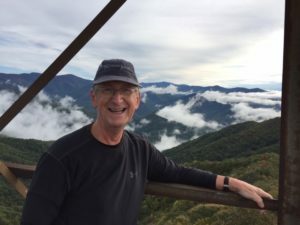 JP Smith – I had hiked many short hikes with the Maggie Leisure hikers, whose hikes were limited to MTS trails and trails in Pisgah National Forest. Although I enjoyed these “walks,” I wanted more of a challenge. Once I hiked my first trail in the Smokies, I was so taken aback with the beauty that I knew I wanted to see more. 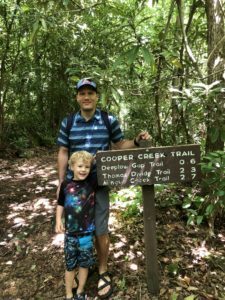 Dave Worth completed Cooper Creek Trail, his final trail in the challenge, with his 5-year-old son, Silas. Dave Worth – I grew up near the Smokies and got started hiking at a young age. I started tracking my miles in 2002. My dad and I had done most of the “classic” hikes, and I wanted to start tracking what we had and hadn’t done already. I would say probably 30 to 40 miles of trail carried over from early hikes he and I had done together previously, but hiking with the intent of completing all the trails started in 2002. Steve Pierce – I completed a couple of challenges with the Carolina Mountain Club. So when I learned of the Smokies 900, I was intrigued. After a few hikes I was hooked. While hiking in the Smokies, I met another hiker who was completing a map for each of her grandchildren. After I finished my first map, I decided to honor both my granddaughters each with a map. FOTS: What did you enjoy the most about the experience? JP Smith – It gave me the challenge that I wanted. Additionally, I so enjoyed discovering the diversity of each of the trails, such as views, terrain, creek crossings, rock hopping, flowers, foliage, and the beautiful orange, yellow and red fungi. Dave Worth – This is a difficult question to answer, but more than anything I feel the most rewarding part of completing the Smokies 900 was simply the sense of place I developed over the 17 years I spent hiking all the trails. I have so many memories that are tied to the Smokies that it’s almost impossible for me to imagine what my life may have looked like otherwise. I began hiking the trails as a child with my Dad. Now I’m taking my son on hiking trips to the same places I went as a child. So many of my favorite moments are contained within the journey. The most rewarding part would be the gradual accumulation of those memories with friends and family. Steve Pierce – The most enjoyable part of the experience is twofold. One is being in the Smokies and seeing all the varied sections of the park. The other is meeting fellow hikers who share a love for being on the trails in the Smokies. FOTS: What is one piece of advice you’d give to someone considering taking on this challenge? JP Smith – Prepare for the challenge. Read the “brown book” (Hiking Trails of the Smokies) or Hiking Trails of the Great Smoky Mountains: Comprehensive Guide by Kenneth Wise …these books provide you tons of the information about the trails…elevation, terrain, creeks, old homesteads, and other info. Take rain gear if there is any chance of rain. Steve Pierce at the Shuckstack Fire Tower, just off the AT near Fontana Dam. Dave Worth – Hiking all the trails in the Smokies can sound intimidating, but this is something that nearly anyone can do. The amount of knowledge and gear needed to get started on this journey is minimal – a trip to a park visitor center or local outfitter is all that is needed at most. The most important thing is to just get out there and get started. You will learn everything you need to know along the way. Steve Pierce – Get a good trail map and plan some easy to moderate hikes to begin with, either an in-and-out hike or loop hike that is close to a visitor center or other popular area of the park. The Friends of the Smokies Classic Hikes are a great introduction to these trails and also give you the opportunity to hike with experienced hikers. After you get your “trail legs” and some experience, then go after some of the more challenging hikes. Danny Bernstein shares her enthusiasm for hiking as a FOTS hike leader and in books she has written about hiking and National Parks in the South. At the panel discussion, Danny talked about the challenging logistic of determining roads to get to the trails. The park has three main entrances — the Oconaluftee Visitor Center in Cherokee, North Carolina, Sugarlands Visitor Center in Gatlinburg, Tennessee, and the Townsend Wye in in Tennessee. 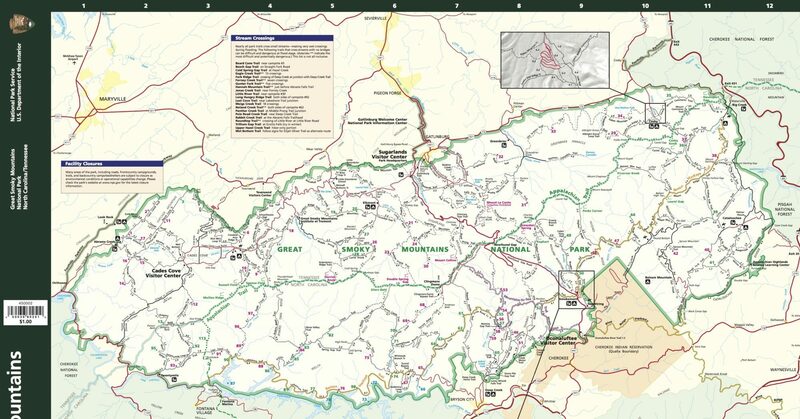 Danny talked about other entrances, including Cataloochee, Deep Creek, Lake Shore Road (Road to Nowhere), Big Creek, Cosby, Greenbrier and Fontana Dam. Danny also mentioned other National Park hiking challenges: Yellowstone (1,002 miles of trail) and Sequoia and Kings Canyon taken together (810 miles). Danny encouraged hikers to join Friends of the Smokies to help support GSMNP. One of FOTS projects is funding a Trails Forever crew that restores popular trails in the park. The Trails Forever crew has restored Rainbow Falls, Alum Cave, Chimney Tops, and Forney Ridge trails. This year, the Trails Forever crew will begin work on Trillium Gap Trail. To support the Trails Forever program, you can make a donation here.